Title The Eye -- the logo for this directory. Leo Tolstoy said that our eyes are the "mirror of our souls"... Yes, but what about our voices, or the body language... Well, this is my POMO stand: everything is a message (semiotics), and since everything is recorded nowadays, this is our cry to the universe. Or something like that. Read on! I guess, this chapter is the reason why they thought that I should get it straight from Lucifer himself. I wrote my notes long ago, but I have to admit that he was a real help to move the text to another level all together. I have to comment on my own writing in this chapter, since now I know him personally, but I do not want to rewrite everything (that is what he wants me to do, you know they say -- "The Devil made me do do it"). And I have to tell you that there is nothing evil about him! He has an independent mind, but I think that is a great quality. He questions everything? So do I. He likes women. Me too. To be honest with you, I try to understand why he got such a reputation and I wrote about it a little in Part II. Devil, but whatever was bad about him before the New Age, now is positive. His defiance of God is a requirement for today. His rejection of authorities is very postmodern, if you will. His closeness to us is admirable. He understood the superiority of flesh over the virtual world and this is what he wants to learn -- the feelings. This is our deal (no, we didn't sign it with my blood, this is fiction, you know): I teach him about body, he teaches me about the spirit. If you read my previous book SELF, you know that I spent a lot of time with God, with all of them --the Father, the Son and the Ghost. But there are things that God can't experience. God is not a creature. Even Christ is limited in that respect. I am on the another hand is both -- Created and Born. The "born" part is something I have to deal in the next book TECH, but being a creation, this is something I and Lucifer share and can compare the notes, sort of speak. My experience of being created is way in the past and clattered with much more recent experience of being born. Lucifer on the contrary had only that experience and he said that even remembers it (I do not know if it is possible; like people who claim that they remember their own birth). Nevertheless, this common quality in both of us is essential (what is interesting, he apreciates my creativity, but creative himself -- he explains it by the lack of emotions in him). Maybe you do not really feel that you are a creature and it could be a problem; you will a difficult time understanding my thought. Maybe it will help you, if you will see it at least in social terms; after all you are a creation of the time (Marx), personal upbringing, parenting, schooling, your own will and mind, and etc. If you can start at least on those grounds, then there is a chance that you can follow the Idea of Resurrection, that is what the Third Age is for. Without understanding the principles of the Creation, Resurrection is impossible. Here again we have a lot of misunderstanding; Resurrection looks like a miracle only from the outside. From inside it's work. Look, a TV set could be seen as a miracle, if we never saw it before and have no idea how it works. The same with the Resurrection. Now, Resurrection is OUR business -- mine, yours, all of us -- and we do need to have a plan. "Plan and Discipline" -- Lucifer tells me every time I am about to give up. Step-by-step, little-by-little, think big, start small, and so on. We have the experience, you all watch movies, all we need to do is to understand what this experience means. Lucifer loves movies and claims that he invented it, at least that it was "his" idea. All right, I will give him that much -- and this why I wrote this chapter in the first place. Of course, I know him in the last, third phaze. I only heard about his past: the Prince of Light, The Revolt, The Fall and history of being Evil... I can talk only about I know, Lucifer, I personally know. Yes, I do use Lucifer's Notes in my film analysis classes. Maybe in this chapter I can link the traditional (intellectual) analysis to POMO methods (experience), in Film600. It's always there, the invisible -- darkness. We need light to realize it... In darkness come the shadows of light. Life arrested and brought back. Oh devil! How could it be! What does it mean? Darkness is needed. If we don't have it, we have to produce it -- the darkness. The darkness wasn't created. It's always there where is no light. The first hero of light industry had a tragic history. Greeks called him Prometheus, Christian -- Lucifer. With the birth of light, the darkness was born. This is the first event. The rest is history. How to connect an illiterate (dark) mind to the world? Let's go to the movies! New History is driven by the needs of media, needs to watch (to have) history. Postmodern = future as present. Resurrection makes past into a material for a future. We photograph -- present became past without loosing the presentism, because it's possible to see it in the future. Light recording is a (visual) duplication, not just a memory. [Impressionism spreads out at the rise of photography -- painters recording their emotions, impressions of the real.] Previous distance between past, present and future was redefined. Motion pictures -- wishful thinking, dreaming, our semi-sub-consciousness, stream of collective conscience. Pictures in motion -- playing with visions: entertainment. Changes (events) attract; even flame has this gravity of interest. We "read" motion in still picture; motion picture "reads" itself. Collective? Secrets of speed: cuts on motion are "invisible". Video doesn't blink? (Replacement). By "cutting" space we are "speeding" in perception, we jump (not "flying" zoom) not between objects only, but subjects (POVs). We see what we are not suppose to see, what is outside of our natural sight. "Anatoly, explain yourself!" I hear his voice. All right, the cut (or "blink") it's not only a break in seeing, it's a negation of space. You might consider it 'The End of the World" -- and it is, but our mind (memory) restores our confidance in the world's existance (there are many good book already written on the nature of duration, repetition and continuety -- this is philosophy, not my subject). The energy (or drama) of seeing is in those breaks, when deep down we are not sure that the world will be back, when we open our eyes again. This is catastrophic undertone, which the film phenomena is based on. Now, when we return back from the cut or blink, since the world was gone for a moment, we return not to the same spot fromwhere we left. Although the space was gone, but the time wasn't, we are returning to a new time-spot and it doesn't have to be the place I left -- on the contrary, the angelic travel, according to Lucifer is in this ability to move in time as if it's a space. And this is how they get other identities (the famous business about them "possessing" people). It's all about assuming a different point of view, which is a piece of cake for the spirits, who have no bodies. Of course, it's not "instant" sort of speak, but with the speed of light, as we know now. And this is what I meant saying that we can see (thanks Lucifer), what we normally can't see. We can see it because of the condensation of human experience (technology); I see it because all the human history is invested into this creation of the apparatus of the new seeing. Movies: "experiencing" as a method of PM non-thinking thinking (F). "Thinking" is uncontrolled in my dreams. Free association laws, day dreaming -- mind works non-stop. We need very little to format this natural tendency. Images of light (reflections) are close to my feelings-thoughts (reflections also). Seeing lives on memories of real experience (emotional recall). Dreams are fast, compressed experiences of experience. Cinema couldn't be possible without centuries of Christianity. This insistence on other (virtual) world and our need to see it. We made an invisible into a transparent. The inner world of an individual became a focus of public attention. My private feelings became an object of value. "Bad and good" thoughts are possible only within the realm of morality. Mind control -- we need it. Reality of thought established its presence with a concept of sin. Feelings are actions. My (subjective) feelings became objective! The idea of sin was to move control deeper, into areas out of our control. I was free to control myself, to police my mind and to discipline my soul. I wasn't God's child anymore, I was Christ's brother. Thinking of killing became more important than killing itself; church can forgive a murder but not an unrepentant soul. "Entertainment as Idealogy" lives on recycling of viewers' emotions, initial feeling (private) are enlarged, processed by media, (re)formulated -- and given back to the original generator as his public (legitimate) emotions (his experience with others). Market can't offer anything which doesn't exist in consumers (as a need; Marx). The collective conscience works as this mind formulating what he thinks about what he feels. TV is instructional (emotional education) and represents a society which connects mind and soul of so-called individual. Without society being constantly present he wouldn't know how to relate to himself. Before there were moral laws which served this guaranteeing function. Concept of sin was a private sensor; now it is technologically a direct involvement in inner structure of post-humans. It technology is an extension of man, the opposite is also a true. Man is an extension of humankind. Communism is based on this model of total integration of individual, when one has no independent existence from the rest. Photograph, film, television, video, cybernetics -- giving birth to each other, negating the former, getting its own qualities. In one century so many "generations"! The process works in both directions: connecting the objective and subjective space. The true aim of CNN is a globalization of mind. At the expense of being centered in itself? New (super) mind is supposed to be an extravert. The colonization of the world by televisual space? Event? War? Why should we call it "communication" v. contact, becoming new One? We change the world by watching it (tv-cam on "smart weapons"). Watching is a control, next -- the disciplined objects. Your independence ends with a video camera being pointed at you. Visual conquest. That's how all conquests begin. The mind is also this event-based-space. It is a constant change and looking for a life outside. Camera is an extension of an eye, but an eye is an extension of mind. I recognize (identify) the motion because I am the motion. "I am not Jesus," Lucifer was reading what I just wrote over my shoulder. "This is something you have to explain; that the time is actually is your product, or by-product of existance and the basis for the notion of motion." "All right, all right! Just don't do again, the jumping, I asked you many times!" He is correct. The time is not somewhere "outside" me, I am the generator of it. Mixture of two, the third type of energy, kinematic? When the subjective energy became objectivized, did the objective world went through subjectivization? 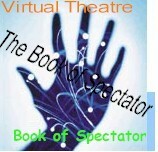 The virtual will merge theatre and cinema (see Virtual Theatre Files). Digital -- the end of postmodern? Soon we won't be able to distinguish real and fictional, past and present, here and there. Coverage: closing the real, making its very existence impossible. The Real (in our world) asks for archeology, restoration, reconstruction. Not possible, only an approximation. discovering the real. Human feelings are only a part of his sensitivity. Do angels laugh? We thought that devils do -- they are angelic in nature too. What is an emotional chronotope (space-time continuum) of virtuality? Experiencing images as reality. What is an illusion? Feelings of images? Angels cry and devils laugh. Semiotics = methods to measure unmeasurable. Semiotics for me is no more than math is for a scientist. It's a language to view and to describe reality as text. "Camera ready? Roll the camera!" Simulated Presence was a build-in mechanism in broadcasting... Watching TV is a distribution of power between the viewer and the viewed. (Sender-receiver relationship is in question -- see McLuhan's tetrads. Communication or contact?). We believe that we have the power over the viewed because the rule of the remote control. (In reality, it is the material that is being viewed that exerts its power over the viewer in that it controls what the viewer sees.) It can manipulate what the viewer perceives about its content. 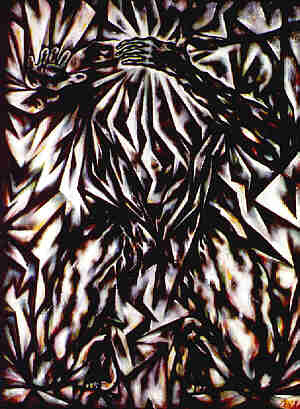 This manipulation is based on visual, dramatic, virtual. The Virtual is all virtues in one; it always visual and dramatic. I am in the center of events (dramatic), and I am everywhere and see everything (spirit).1 Both are illusions of camera work. Because I am not even there, I am on the sofa watching invisible myself in my dream. Where am I? May be I should ask "who am I?" Ideal (virtual) reality is pure reality, resurrected, purified, reconstructed, edited, processed. Better reality and best of the real (after or before the real?). Real reality, super and hyper reality, and - pseudo reality. Reality is the catastrophe of the virtual, stopped, slowed down angelic world. Resurrection is the miracle (catastrophe) of the real. VIRTUAL REALITY = resurrected reality, ie. formerly dead.4 By the nature of time, it dies all the time (process, negation, changes). In our time, moving with a speed of light, this natural and normal phenomena became the basis of our sensitivity. To prevent time from disappearing we have to record it, we have to kill it in order to save. It's already dead. That's why we can record it. When "what" do I see? Dreams. Now you know how it fills to dream somebody's dreams. Proto-humanity -- "Sucker is born every minute." Harvesting humans, expropriation of time (see _Time production_). TV: Instructions on how we should experience the events. The screen, the icon -- presence of God -- hello, sucker! Get yourself a bigger screen. Do I have a choice? Turn it off. To see or not to see... The more you watch, the less you see. Light of speed? Too fast for me, a human... not angel. I lost before the game began. From my birth I do nothing but fight for freedom. Independence from everything? From life, real? I had no room to go down, only up. But I can give up. Stop -- that's all what they ask. TV is the first cyber kingdom. It was an electronic projector from the start. Our pm technology is based on light. All life is based on matter. Electronics -- life within the speed of light. New virtual theology? The universe is the message and the media, God's propaganda. The resurrection is our answer.7 "The origin of the word propaganda is well known: *propaganda fide*, propagation of faith." (V 13) Theory of Viewpoint: does universe has an agenda? Life/being as a message (and messenger). To see without being seen... is it possible? That's why God is invisible power! The world's gaze on me, God's eye! This look is nothing less but the universe itself. Being watched is being loved. Brought into a spot light. "*The phatic image* -- a targeted image that forces you to look and hold your attention. More importantly it is the result of an ever-brighter illumination, of the intensity of its definition, singling out only specific areas, the context mostly disappearing into a blur." (14) Framing is always present, always selection, "closing our eyes" on everything else. Seeing is a constant decision-making process. Instant judgement -- what to see and not to see. Too fast to think about, you can only react. Oh, Cinema - the angelic language of light. Better, much better than life. It's human, meaningful, addressed to me! Seeing through Christ's eyes. Light is a quick matter, a matter is a conserved (suppressed, and compressed) light. Physics, the basis for metaphysics. Now the reverse, new science is based on fantasies. We use laws of nature to exercise our wishes. Technology is the metaphysics. Too much light causes blindness. Light is the heart of darkness. We need darkness to have light. "Before" light there was no darkness. Black holes are not nothing. The Nothing is gone. TV: waiting to forget. Day dreaming. Pleasant death. Is that's how the afterlife looks like? Recording everything is the way not to remember. Hard drives are our memory. The lies of cinema weren't around the clock: give us TV! Television lied. It promised us "live" picture. Promised to be a media not a message. Messenger without agenda, taxi driver who doesn't talk, think, live. Live pictures without its own life? Don't I know that this child of war intelligence never tells the truth? Anti-film cinema: "Capture, don't reconstruct." (Stroheim). Documentary -- an attempt to see, craving for the Real. Like light itself, how do catch it? Moving faster than the speed of light. Impossible? Even for a thought. Einstein limited not only the universe, but mind. TV betrayed its promise? It's not a telescope, microscope, glasses, not an extension of man, but men. In Chapter 5 of "Sightless Vision" Virilio talks about "a population of objects all busy staring at you." (V 62) Cash machines and ABC news division. R world is always ready. Electronic sensors in public bathrooms, flash after you leave and turn light off. What a sensitivity, what an attention! Surveillance: industrialization of vision, everything has to be observed, or be ready to be seen. To be see even if I don't watch it. But all is recorded! SHOTS are based on CUTS (not seeing). Between photo and motion: Slow motion, now: virtual imagery -- seeing what we don't see. Changing the SPEED. Speed is registered only in acceleration -- cuts, montage. After we concur the speed, we can play with it. We lived for so long without noticing the inner life of life -- changes. Photo not only stops the motion but according to E.'s theory makes it happen -- without noticing an event it has no (integrated) life in OUR universe. In the past we only reacted, now we want to act first, to attack the nature, to control. Science is a military intelligence of humankind. Overexposed? Remember: the exposure time that allows (or edits) seeing. "So the act of seeing is an act that proceeds action, a kind of pre-action..." (61) intentionality. Pre-contact, before interaction. Energy of imagination, thought, emotion? Energy of thought: kinematic energy, energy resulting from the effect of movement, and its varying speed, on ocular, optical or optoelectronic perception. Thought as a physical phenomena, part of the material universe. Human = the life of time: "the intensive time of human perceptiveness." (Virilio) How to measure this time's intensity? Mass media, massive time. My (potentially public) time. NET and WEB for Me! Hey, we're not just dreaming of blindness, we're getting there! We, the masters of light, have to create darkness. How else would we be able to separate the two? The neo-realism of virtuality has to produce the un-real, which is part of a deal. "Go-go" is a motto of light. To stop is to die. We forced to move all the time: no such thing as `fixed sight.' Even the staring. Changes make world visible. The space of sight is accordingly not Newton's space, absolute space, but Minkovskian event-space, relative space." (V 62) Event-space: changes (including thought or emotion) ask for attention -- vision. Question # 2: What about non-seen events? Einstein: we can't judge their existence. In paradise China exists only if we all can see it! We would look at China only if something important for us takes place over there. What is could be? A disaster? This event-organized space means that only eventful space exist (or noticeable). More so, space comes into existence only at the event? China is an idea, a concept, which has to become an image. Image? Now I and China are within the space where our meeting is possible; virtual space has to be produced before any event could take place in it. Philosophy of the accident, when China unexpectedly enters the space of virtuality, is a break of paradise (hell). We remember Chernoble, we knew nothing about the place, not even a name. It wasn't in public domain, wasn't collective property, wasn't watched all the time by Ted Cappol. Don't we all sorry for neglecting the poor guy who missed the moment of the meltdown? The KGB knew that all and every one must be watched, pay attention to love, monitored -- and we didn't believe that it was a ministry of love. O.J. is not guilty! We didn't see it! "It is in fact *will*, the will to engage the future, yet again, and not just represent the past." (V 64) Mechanics of resurrection! TV: "public image has today replaced public spaces" (V 64) Church, market, square in one. Everything that been seen by media becomes PUBLIC (property) -- and replacing the public. "TV studio," complained TV correspondents. How could the republicans do what they, the media, supposed to do! Infomercial! Next time we would even bother to "cover" such events (Democratic convention in Chicago. They did), because the party did its own coverage. "Television is a media of crisis9, which means that television is a media of accidents." (V C) Fifteen thousand journalists came to see accidents, and weren't ready to simulate accidents. It's okay, next time. That's what their analysis is for. From campfire to TV set: it took (only) a few millenniums. TV and total spectatorship: you see all you're missing out on, everything you can't have. You never catch up, you always lose. "Life" TV? How would I know? It always "live" when I watch it? Two senses instead of three: present-present and past-future. Processed through media life is not just transmitted by also recorded, memorized. Freeze frame (photo effect) is the arrested form of time. Present forever, restorable past, everything could be recalled in form of visual. Hey, this is a result of traveling with the speed of light! PRESENT-PAST, PRESENT-FUTURE: resurrection chronotope -- past as future, and present as both. Delayed Time is a recorded (saved v. killed) time, noticed. "Real" time is the time of recording. How could I know what is "real" -- not in virtuality. Cold War: a transfer of war from the actual to the virtual. The Gulf War -- hot cold war. Depth of time (space attribute), concentration and conservation of (human) energy. Intensive time will (try) then replace the extensive time. Time can't be wasted, it has to be utilized, it has to be used. "Secret" -- removed from understanding. Unknown. Time is a killer of space. How do they coexist? They exclude each other! Space of time (determine by the attributes). "If the categories of space and time have become relative (critical), this is because the stamp of the absolute has shifted from matter to light and especially to light's finite speed. It follows that that which serves to see, to understand, to measure and therefore to conceive reality, is not so much light as its velocity. From now on, speed is less useful in terms of getting around easily than in terms of seeing and conceiving more or less clearly. Time is unifying factor of space? Time of time? New type of time? "New Times" -- declared the new age. Intensive time: Time within the speed of light. For an outsider there's no time in such a time (light). Instead of `At what space-time *distance* is observed reality?' we should ask: `At what *power*, in other words, at what speed, is the perceived object?' (could we even call it `object'?) Who is the observer? (Einstein). The heaven and earth -- gravity? 1. Matter had no forms. First day ends in creation of light by separation of darkness. The world was borne out of the desire. Angelic world existed before the creation, it was an apparatus of the creator. The world was created in its image and likeness. 2. the disintegration of the time of light. Controlling time is similar to controlling nuclear reaction. Light was the begining. And it's the end of the material (A bomb). Nuclear explosion is the release of time (matter) with a speed of light. Nuclear reactor is a slow process of this explosion. Intensive eternity and empty infinity. 8. SPEEDING UP: LIVING IN "SPEED WORLD"
High speed = intensity (of light) (not light and dark). Original meaning of "speed" -- to prosper (to succeed in living). Existing world (we before us), extensive, could be and still is described in a time-space continuum, not the resurrected (ing), not the process of creation. Becoming-real is different from reality. God and Marx wanted to change not to explain the world. human, will; or even a feeling (potential, kinematic energy?) is the source of becoming? The will of the observer to see (participate) in any event is the basis for this event's occurrence. It takes place because I'm looking? The universe of wishful thinking? Very human, super-real (unreal). The difference between the will and the wish. The faith. Sin is wrong thinking. Wish or desire? The New Universe as a new organic system: universe (nature) + humanity. In film I project myself on the screen. For tv images I am the screen. Shot is essentially a cut (framing) of reality. We target some objects to transform them into images. Pictures or visions? Always a combination of many major types of montage. 1. Metric Montage (basic), is included in all other forms? ("Rude motive force" -- Action Movies). The chase? 2. Rhythmic M (metric with the content consideration, "primitive-emotive"). 3. Tonal (measured by "emotion," "melodic-emotive"). 4. Overtonal (psychological -- higher than physiological, contains it). 5. Intellectual ("conflict-juxtaposition of accompanying intellectual affects" -- ""the intellectual overtone"). In VR POVs become constitutional principles. Structure of experience is based on POV. YOU is something between I and HE. Estrangement from both. YOU is the place where I meet the Other. The Other could be you. Single and Plural? Only as nominations. Montage and music (composition). Minor (sad), Major (happy) tones. Minor could be lyrical (passive), tragic (active). Color of emotion. The viewpoint of emotional expression! "Orchestration" of visual reality. Instrumentation. SILENT MUSIC (Space is architecture. Time is narrative of it. Reading). Melody: trajectory of POV. (Line = trace of energy). Film's "melody" (themes); "texture" in Aristotle's classification? Silent music of montage, visual (non-sound) music, tempo-rhythm for the eye. Montage constructions -- relations of conflict with each other (?). "Tonal montage grows out of the conflict between the rhythmic and tonal principles of the piece. Five methods are the basics of montage theory. The secret is a combination, transformation, transition between the five. Einstein meets Eisenstein. Heidegger on the end of philosophy and film as para-thinking. Observer can't be separated from the event; therefore Identity and Identification should be seen as a (complete?) event. Screen event requires the first viewer (director), representative of public. POV and Mise-en-Scene (See Narratology) -- pre-arranged reality for (filming) seeing. Next step of subjectivation -- camera (framing). Third -- montage. POV is in between Identity and Identification. POV is almost undetectable because of the power of identification. Anything visual has this gravity of subjectivity. Spectator: Idea of Alienation and Idea of Identification. "Existence is Identity," and "Consciousness is Identification," American version of existentialism (Ayn Rand) equals camera with consciousness. Is there Identity without Identification? Identification (spectator) is a completed alienation of reality. As well as the spectator (full involvement), who loses "real" reality and lives within the screen (virtual) reality. Even surveillance camera represents somebody's pov. Making world meaningful. As long as something exists we have to find its message. Nothing accidental -- no place for stupidity? That's the place for idiocy to triumph. Mediating we produce massages. You beet not to look, man! Director's interpretive Using the special techniques of the medium, the director manipulates us so that we see the action of the character in the way the direct interprets them. Indirect-subjective A viewpoint that brings us close to the action and increases our involvement. It provides us with the feeling and sense of immediacy of participating in the action without showing the action through a participant's eyes. Objective The viewpoint of a sideline observer, which suggests a relatively great emotional distance between camera and subject, with the camera "simply recording," as straightforwardly as possible, the characters and the actions of the story. Subjective The viewpoint of a character participating in action. (See Point of View, literary). 1, 2, 3 are variations of 4. POV can't be objective. Not identifiable? Yes. Lacan's mirror stage: the world needs to see itself in order to develop its (collective) consciousness. Photograph is the product of complete alienation (Kracauer 15). Magic mirror metamorphosing (part of alienation process). Far from "recording": what is "recording"? Interpretation (relativity) is build in an element of seeing. Why do we need "personalization"? I am the world! Does film establish the fact of physical existence? Space is only a material? Time is a method to play with space? Film goes for "natural" because it's un-natural in its methods. Spectator (camera) is the engine of the Resurrected world. Why did we need to invent (discover) film? The reality lived separate life from us, it was "Godless" (with Christ) world, where we weren't mixed with the universe. Dramatic (hidden POV) A viewpoint wherein we are not conscious of a narrator, for the author does not comment on the action but simply describes the scene, telling us what happens and what the characters say, so we get a feeling of being there, observing the scene as we would in a play. Omniscient Narrator (God's POV) An all-seeing, all-knowing narrator, capable of reading the thoughts of all the characters and capable of being in several places at once if need be, tells the story. Stream of Consciousness or Interior Monologue A kind of first-person narrative, except the participant in the action is not consciously narrating the story. What we get instead is a unique inner view, as through a microphone and movie camera were in the character's mind -- recording every thought, image, and impression that passes through, without the conscious acts of organization, selectivity, or narration. (See also Cinematic POV). Third-person Limited The is omniscient except for the fact that his or her powers of mind reading are limited to or at least focused on a single character, who becomes the central figure through which we view the action. Point-of-view Character: A film character with whom we emotionally or intellectually identify and through whom we experience the film. Voice-over narration, editing, and camera position may be employed for this effect. Dramatic (intensive) time is the time of cuts16 -- new time, constructed in motion of moving from one observer to another. They all have triadic structure when I, You, He coexist, as well as past, present, future. Instant identification (enforced on my by camera), total destruction of individuality. I move from one mind (POV) to the next with the speed of light (Internet model). Flashback instantly becomes present, without losing quality of being a past, but by its compositional (narrative) status of being a "future' for anything after this flashback. In chronological universe past is historical, not in "emotional" (personal) "space." Dream Machine: the art of spectator -- you create the environment for your reactions. * home * about * guide * webmasters wanted * classes * advertise * faq * contact * news * forums * mailing list * bookstore * ebooks * search * calendar * games * polls * submit your link * web * 2008 ?